It could be said that one of the great bastions of American Evangelicalism – or perhaps I should say, American Fundamentalism – is the idea of reading the Bible literally. Whether you’re a Christian or not, you’ve probably heard it all before. The Bible is the Word of God, therefore everything it says must be taken “literally” (scare-quotes are intentional). To be fair, I understand where this emphasis on Biblical literalism comes from. Coming off the heels of the Protestant Reformation – which championed the great truth of Sola Scriptura (contrary to popular opinion, this does not mean Protestants affirm Scripture alone, but what is meant instead is that all truth necessary for our salvation and spiritual life is taught either explicitly or implicitly in Scripture) – the Western church was soon met with a new opponent: theological liberalism. At the root of this new religion – and it is a new religion – is the assertion that my own intellect has the right to choose what I want to keep from Scripture and what I want to reject. In its attempt to hold on to historic Christian orthodoxy, American Evangelicalism – and soon, its fundamentalist counterparts – began to champion Biblical literalism. Biblical literalists will say, “We have no right to pick and choose what we want out of the Bible, after all, it is the Word of God. Therefore, we must read the Bible literally and do everything it says.” I understand where this idea comes from. I do. And I want to be as fair and gracious to its proponents as possible. The problem is, I strongly disagree with it. Jesus says to serve the poor. A lot of Christians don’t serve the poor, but seem to be interested in telling other people what not to do. If they read their own Bibles, maybe they’d get their act together. Why do Christians think they can tell other people what is moral and ethical? Their Bible says that you shouldn’t eat shellfish or wear clothing of mixed fibers – they’re all a bunch of hypocrites. I’m sure you’ve read something similar to what I’ve summarized above. Yet, its often not the non-Christians who say the most offensive or dismissive comments in these contexts, its the professed Christians. The most common responses I find from Christians in these situations sound something like this, “Repent or you’re going to hell – the Bible says so”, or “God said it. I believe it. That settles it”, or “Well the Bible says ____ so you’re wrong”, or some other aggressive comment about “what the Bible says.” After all, if the Bible says that men “pisseth against the wall”, then you better be a man and go pee on a wall. The reality is, we should not be surprised that the culture around us argues based on a position of what the Bible literally says. After all, this concept is what much of the American Church has been championing for the last century. In all fairness, we’ve only brought our cultures Biblical illiteracy on ourselves. By emphasizing one idea – Biblical literalism – we’ve neglected to actually tell people how the Bible is meant to be read and understood. Now its not only the culture around us that doesn’t know how to handle the Bible, but the average lay person sitting in our pews. The Bible is not a text that is meant to be read literally. I bet that comment made a lot of you uncomfortable, so I’ll say it again. The Bible is a much richer, more robust, far deeper, and more profound book than one that can simply be read literally. No, the Bible is a text that is both living and active (Hebrews 4:12) and is begging to be sought after and understood (2 Timothy 3:16-17). So how then are we meant to read it? How can we properly explain to other Christians and the culture around us how the Bible is meant to be read? I’m glad you asked. For those of you who know me, I hope you wouldn’t think that I’ve gone off the deep end and rejected the authority of Scripture. For those of you that don’t know me well, I present to you: the bait. Now let me show you the switch. My proposition for communicating the historic, orthodox and Protestant position on the Bible is fourfold: The Bible is God’s written word that must be read literally within its respective genre and proper redemptive context under the guidance of church tradition. 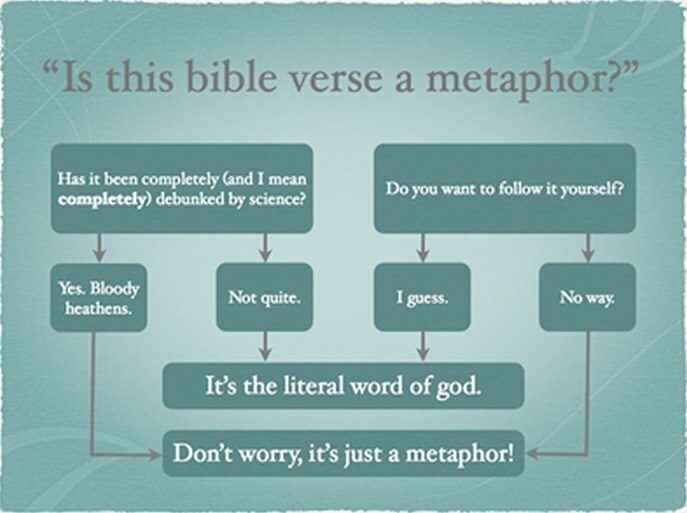 Sure, the Bible is a text that must be read literally, but not merely literally. It must be read within its respective genre. The Bible is full of various genres that reflect the influence of its author and time period in which it was written. Therefore, we must understand the text within the style that it was written. There are many different genres within the Biblical literature: prose, historical narrative, wisdom literature, poems, apocalyptic literature, and epistles just to name a few. The way we read Old Testament poetry must be different than the way we read New Testament narrative. Metaphors must be read differently than straightforward prose. This is why we don’t read a verse like Psalm 88:7 (“…and you overwhelm me with all your waves”) as literal waves, but as a trial that comes from God himself. When we read John 1:43 (“The next day Jesus decided to go to Galilee”), we understand what it meant. Jesus went to Galilee. In a similar way, we must understand the Bible in its redemptive context. Where does the passage in question fall in God’s story of human redemption? After all, if the entirety of the Scriptures are meant to illuminate Christ for us (Luke 24:27, Acts 17:11-12), then the most important task of our Biblical studies is to seek Christ. This gives us the ability understand what it means for the writer of Hebrews to say, “Long ago, at many times and in many ways, God spoke to our fathers by the prophets, but in these last days he has spoken to us by his Son (Hebrews 1:1-2).” If you need help with this, I wrote a helpful post to get you started here. As for reading the Bible under the guidance of church tradition, this gets us into muddy water that doesn’t fall under the intention of this post. One of the most basic differences between Roman and Protestant theology is the role of tradition in the life of the church. While Protestants affirm Sola Scriptura (defined above), we do not discount the importance of church tradition. It is a lens by which we can come to better understand God’s Word in the life of his people. We have the benefit of standing on 2000 years of men and women who have gone before us in faith, and we should not ignore what the Holy Spirit has faithfully taught our ancestors. C.S. Lewis – in one of his snarkier moments – has a great explanation of what happens when we reduce the Bible to mere Biblical literalism: “There is no need to be worried by facetious people who try to make the Christian hope of ‘Heaven’ ridiculous by saying they do not want to ‘spend eternity playing harps’. The answer to such people is that if they cannot understand books written for grown-ups, they should not talk about them.” In other words, if you treat everything in the Bible simply as being literal, then you are unable to adequately understand it. This is why we must have a much more “grown-up” understanding of our Bibles. My proposal is to abandon the solitary tower of Biblical literalism and instead expand our territory to a much healthier and more faithful understanding. We must read and explain the Bible as God’s written word that must be read literally within its respective genre and proper redemptive context under the guidance of church tradition. When we do, we’ll not only better understand the Bible ourselves, but we’ll have better explanations for the society around us, we’ll be better equipped to approach the big issues of our day (ethics, science), and most importantly we’ll be more faithful to the God who was pleased to reveal his Word to us. **Note the irony here. Biblical literalism really took shape against a backdrop of theological liberalism, which argued that we have the ability to pick and choose from the Bible. Now that fundamentalists and evangelicals have championed literalism for so long – without any understanding of the historic, orthodox way of reading Scripture – the tables have now been flipped on us. The culture around us reads the Bible literally, and we’re the ones left being accused of cherry picking. Funny how that works, yeah?